Drifting Dragons Vol. 2 Review – AiPT! Cooking manga meets dragon hunting. I’ve read a lot of cooking manga this year. From Giant Spider & Me: A Post Apocalyptic Tale to Food Wars! : Shokugeki no Soma, 2018 has had a number of memorable culinary comics. 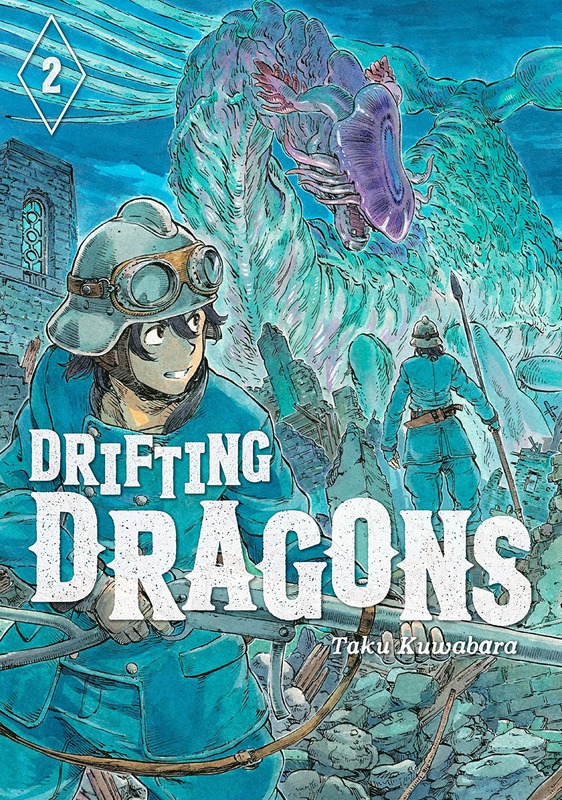 One such series published by Kodansha, Taku Kuwabara’s Drifting Dragons, stands out as unique even among the genre’s other wacky titles. It stars a group of dragon hunters known as drakers who soar the skies in their airship, the Quin Zaza. Most of the dragons they catch end up as food, and there are a number of cooking sequences throughout. The second volume collects chapters 6-11, in which the crew lands in the city of Quon for rest and refueling. Things go awry, however, when they have to save the town from a direct dragon attack. Drifting Dragons is definitely an intriguing series, but is this installment good? The first aspect of this volume that stands out is its artwork. Kuwabara’s lines have a loose, fantastical feel to them while still remaining grounded in natural details. There are several splash pages and two-page spreads depicting terrain, and these look lovely. The manga’s world is fairly classically old-fashioned; there aren’t any technologies present more modern than guns and airships. The skies the Quin Zaza traverses are also pleasing to look at, with large twisting clouds that convey the sheer dangerous grandeur of nature. Unfortunately, the art also has a significant downside. A lot of the action scenes have visual clarity issues, making it difficult to follow the specific details of what’s happening. As a result its easy to find oneself just glazing over pages at a time until the story’s contents become more discernible again. Plot-wise, this volume is solid. It contains the entirety of the drakers’ exploits in Quon, so it tells a satisfying complete story. There’s a good amount of both world-building and character development here, which helps the manga’s world feel well thought out. Though Mika’s actions still seem relatively simpleminded and direct like they did in Vol. 1, we get to learn more about his upbringing here. He actually grew up in Quon where he took part in many of the city’s customs, to include having leather from dragons he killed made into part of a quilt. The town has a giant quilt that has been gradually added to over time, tying several generations of dragon hunters together. This is exactly the sort of cultural context that helps set Quon apart from other fantasy settings. There are also good character moments for Giraud and Vanabell, as they assert themselves in ways that subvert the toxic masculinity present in many of the minor characters. Giraud’s plot line is particularly enjoyable, even if it does border on being overly predictable at times. Nontheless, it’s cool to see some of the more unfortunate aspects of classic fantasy stories get some pushback here. Besides the unclear action scenes, my main qualm with this volume pertains to its status as a cooking manga. Namely, it barely is one in this installment. There are still recipes at the ends of the chapters, but actual cooking isn’t weaved into the story as consistently as in Vol. 1. As a result, the reader gets less of a sense for the savoriness and flavors of the various dragon dishes. Of course, it’s not a bad thing for a manga to simply not focus on food, but Drifting Dragons disappoints on this front because it sets the expectation then fails to follow through with it. It’s not a huge deal, but it’s still a bit of a letdown. All in all, Drifting Dragons Vol. 2 is an enjoyable read. The artwork is very well-detailed and full of lovely nature imagery, even if the action scenes get bland and hard to follow. There’s also some solid world-building and character work throughout. Kuwabara doesn’t reinvent the wheel by any means, but they do deliver classic fantasy fun with a lot of charm. A charming volume with solid world-building and lovely detailed artwork.